A week after Brabham's dominant 1-2 at Brands Hatch the F1 teams were in action again in Holland with Ferrari back in action after missing the British GP because of a strike. The Italian team fielded Lorenzo Bandini and Mike Parkes but it was clear that Brabham's development has left the Ferraris behind and Jack Brabham and Denny Hulme qualified 1-2 on the grid. Jim Clark put his Lotus-Climax in third position while Dan Gurney (Eagle-Climax) and Parkes shared the second row with the Cooper-Maserati of Jochen Rindt and the two BRMs of Graham Hill and Jackie Stewart on row three. McLaren failed to make the start because of continuing problems with the Serenissima V8. Brabham kept everyone amused by limping to his car with a false beard and a walking stick, following suggestions in the newspapers that he was too old to be challenging for the World Championship again at the age of 40, but he then proceeded to leave the opposition behind with another impressive display. Clark took second at the start but was soon pushed back to third by Hulme although Denny ran into ignition problems soon afterwards and dropped to the back of the field and eventually retired. When Brabham came up to lap backmarkers on lap 27 he was baulked and Clark found a way into the lead and the Lotus driver began to pull away until he began to suffer serious vibration problems with the engine. This led to a water pump fracturing and on lap 76 Brabham was able to get back into the lead. Clark pitted to get more water and then fell behind Hill and was only just clear of fourth-placed Stewart when they crossed the finishing line. 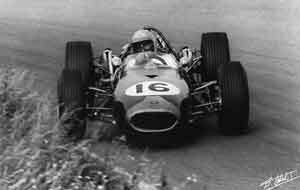 Brabham had by then lapped the entire field.